Music critic Alex Ross, among others, has noted the strange disconnect in the public’s mind when in comes to 20th-century art forms. As he so eloquently argues in The Rest is Noise and elsewhere, while art forms of many genres became deeply involved in various abstract and conceptual movements in the 20th Century, visual arts from the period now fill top tier museums selling tickets to legions of adoring fans, while Western art music has taken a very different course. Those same decentralizing, avant-garde trends that are beloved in the visual arts are seen by many in the public as anathema when it comes to music. Classical music audiences in the U.S. are still prone to prize works of the 18th and 19th Centuries above all else, although many in those same audiences would have no problem waxing poetic on the beauty of a Pollock or a Donald Judd sculpture. So it was with great joy that I attended two of three programs while in St. Louis last weekend as part of Retrospectives and Innovations: A Celebration of The Pulitzer Foundation for the Arts. The mini-series was a look back at 8 years of music programming sponsored by The Pulitzer Foundation for the Arts in their Tadao Ando-designed museum in the heart of St. Louis. The music programming at the Foundation sprung from the mind of Richard Gaddes who recognized an acoustically desirable space in the museum’s galleries at the bottom of a wide descending staircase positioned strategically in front of Ellsworth Kelly’s Blue Black, a painting commissioned by the Foundation in 2000. With the support of the Foundation’s Emily Rauh Pulitzer, the museum’s board approached the St. Louis Symphony and their musical director David Robertson about a 20th-century and newer music series to be held in the galleries of the museum dedicated primarily to 20th-century and newer art. David Robertson, of course, a brilliant music director and advocate of music from that period, jumped at the chance to bring more of this kind of music to St. Louis audiences. Robertson is one of the great American maestros and he was central to last weekend’s concerts which revisited works from concerts over the last ten years since the Foundation's physical space opened in 2001, while also including works new to the series and St. Louis. It was an inspiring set of shows not necessarily because of the specifics of any of the particular pieces or performances, but because of the unavoidable connection being emphasized in the galley between movements in both the visual and musical arts of the 20th Century. It was about an arts organization supporting art music from the same period without apology, a more revolutionary idea sadly than it should be in this country. On Saturday evening, the series welcomed visiting percussion quartet So Percussion, who performed Steve Reich’s landmark works Clapping Music and Four Organs, as well as two of their own commissions: Reich’s Mallet Quartet and David Lang’s the so-called laws of nature. Robertson himself joined in on the clapping after some introductory comments welcoming the players to town emphasizing his personal involvement in the curation and presentation of the music programming at the Foundation. It was a show that not only highlighted percussion’s meteoric rise to prominence in Western art music in the last century but also captured both the raw primacy of the earliest minimalist works alongside the legacy those works left behind. Lang’s three movement piece which finds the ensemble moving with their mallets from blocks of wood, to metal tubes, to flowerpots and teacups was both witty and inspiring in its everyday resourcefulness. 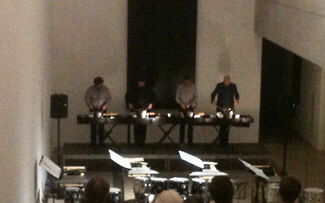 Lang has the four percussionists play identical patterns throughout the piece which each movement using a different set of mostly handmade instruments in a sort-of musical science experiment about the sound of different objects played under identical circumstances. The following Sunday afternoon headed off in a much different direction with players from the St. Louis Symphony who began the final program with Donatoni’s equally cat-and-mouse game of a string quartet, La Souris sans sourire. This “mouse without a smile” alludes to Boulez Le marteau sans maître with an ironic if still reverent sneer as cellos and violas moan with decaying tones which are less Tom and Jerry and more Felix the Cat. The show ended with one of Olivier Messiaen’s monumental works, Visions de l’Amen, played by pianists Peter Henderson and Nina Ferrigno. This was muscular sounding Messiaen with the skies crying out from above that made the most of the indeed excellent acoustics of the Foundation’s space. But perhaps the most intriguing piece on the program that afternoon, and a highlight of the festival was Unsuk Chin’s Fantasie mécanique from the mid 1990s. Robertson conducted the small percussion, piano and brass ensemble, as he noted, less because of interpretive issues and more for simple guidance for a work that rapidly swerves and changes as it goes along from pounding machine like forces to bare stripped cries from various corners. As Robertson also pointed out, it reflected many of the same musical qualities that recommended the composer’s concurrently running Alice in Wonderland across town at Opera Theater St. Louis. It was exciting playing from members of one of America’s great if underrated orchestras. It, and all of the weekend’s shows, was also a testament to the great and forward-looking work that David Robertson is doing in St. Louis and around the country. And all in a singular, lovely architectural space in a city known for its singular artistic gestures.